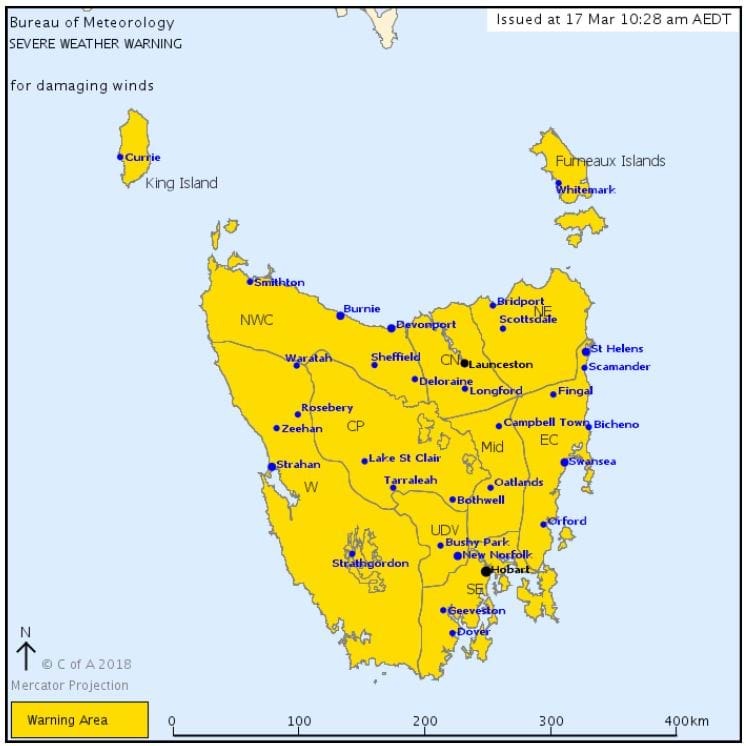 The warning affects King Island, Furneaux Islands, Western, Upper Derwent Valley, South East, North East, East Coast, North West Coast, Central North, Central Plateau and Midlands Forecast Districts. The warning details DAMAGING WINDS EXPECTED FOR ALL OF TASMANIA LATE SATURDAY, EARLY SUNDAY AND EARLY MONDAY. again late Sunday and early Monday morning ahead of a second cold front. Winds are then expected to ease early Monday afternoon. Locations which may be affected include Devonport, Burnie, Launceston, St Helens, Swansea, Strahan, New Norfolk and Hobart. * Check that family and neighbours are aware of warnings. * Manage pets and livestock. * Secure outdoor items including furniture and play equipment. * Be prepared in case of power outages. * Beware of damaged trees and power lines and take care when driving. * Listen to local radio or check www.ses.tas.gov.au for further advice. * For emergency assistance contact the SES on 132500. An update warning was issued at 4:51 pm Saturday, 17 March 2018. The next Severe Weather Warning will be issued by 11:00 pm AEDT Saturday.